As the April 1 deadline approaches, I plan to stitch up a batch of one of my favorite designs. 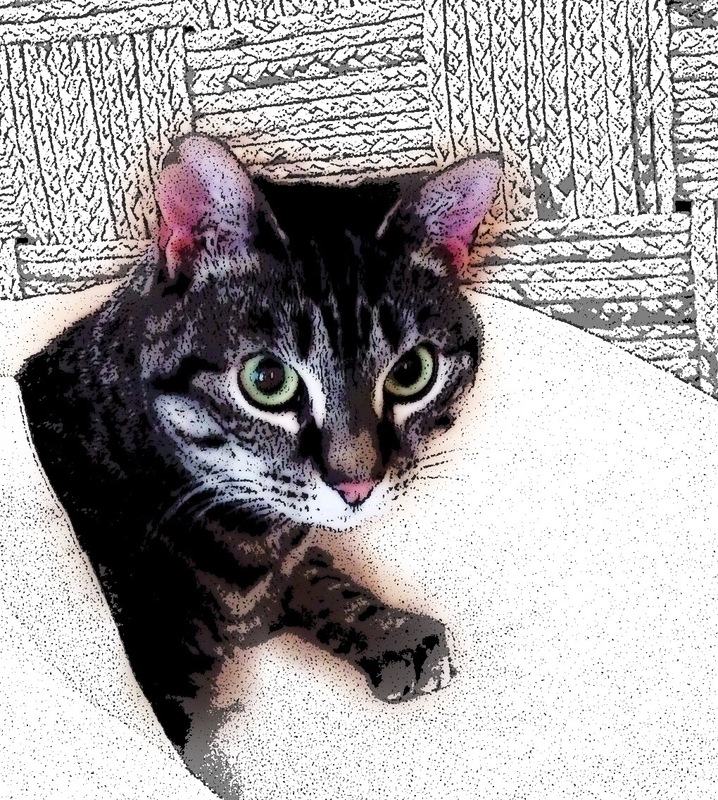 Please feel free to use my photo…or adapt to your own pet! Now that you have your pattern, set the document format to landscape and paste the picture twice, side by side…each image roughly postcard size (4″ by 6″). 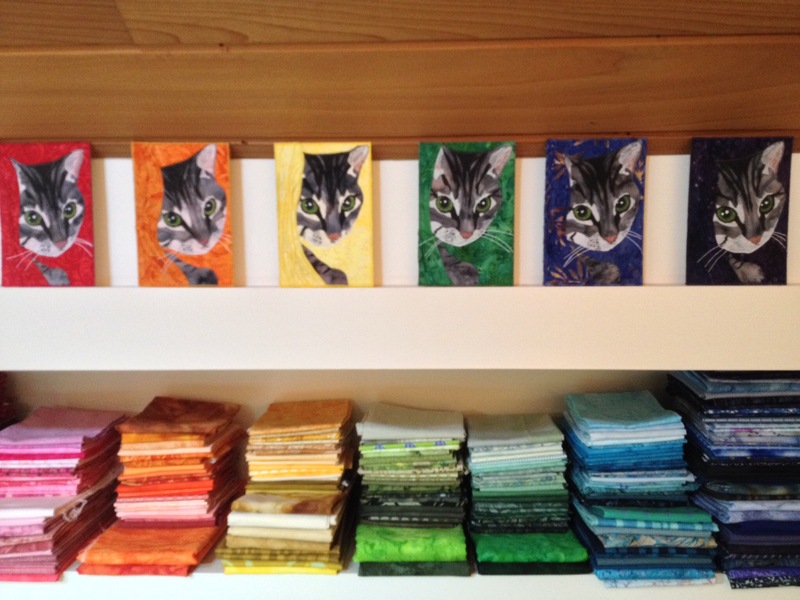 Print one per planned kitty card. 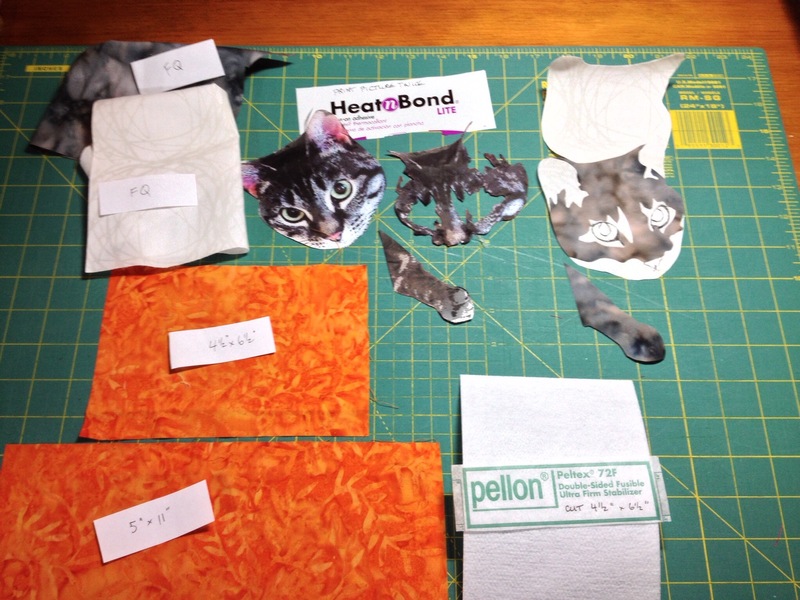 Ok, now time to assemble the components of your project: For each postcard, cut one piece of Peltex II (I like to work with 4 1/2″ by 6 1/2″ pieces and trim to exact size at the end of the process), 2 pieces of bright fabric (one 4 1/2 by 6 1/2, one long and thin), and postcard-sized pieces of cat color- one light and one medium- use BATIK! You will ink in the markings for the dark fur; pens in green, black and grey are used for this kitty. Time to press! 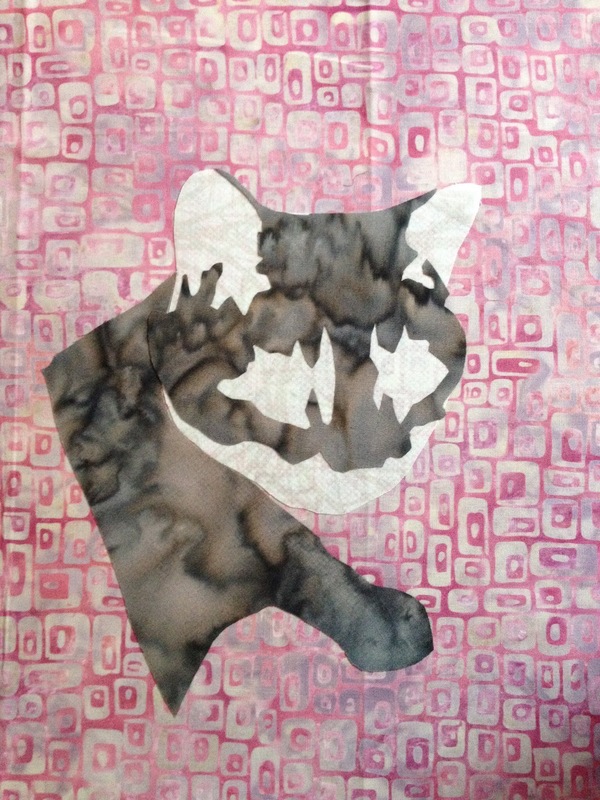 Press freezer paper to the unfused side if you are using MistyFuse…press paper-backed fusible to either side. 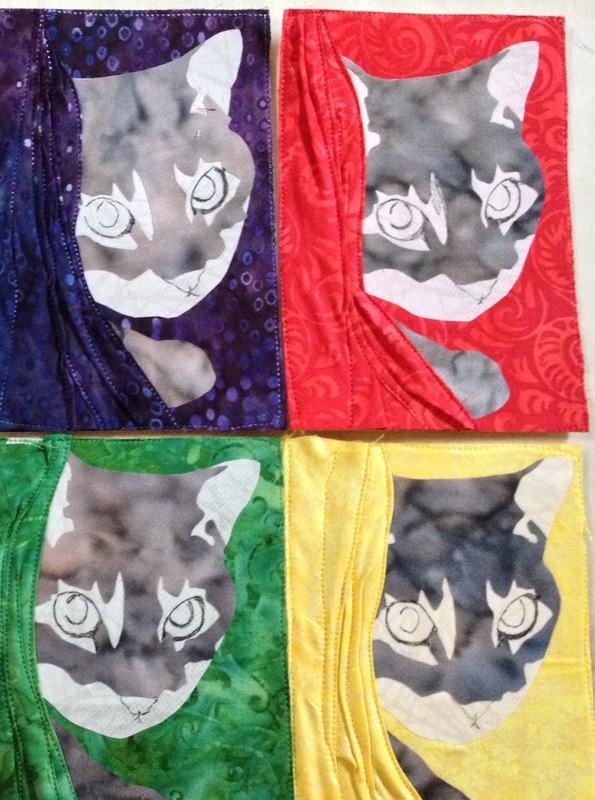 Since you’re using batik, there is no need to worry about a “wrong” side of the cat fabric. Next, fuse your work to one side of the Peltex. Don’t forget a pressing sheet underneath or it will fuse to your ironing board 😳. 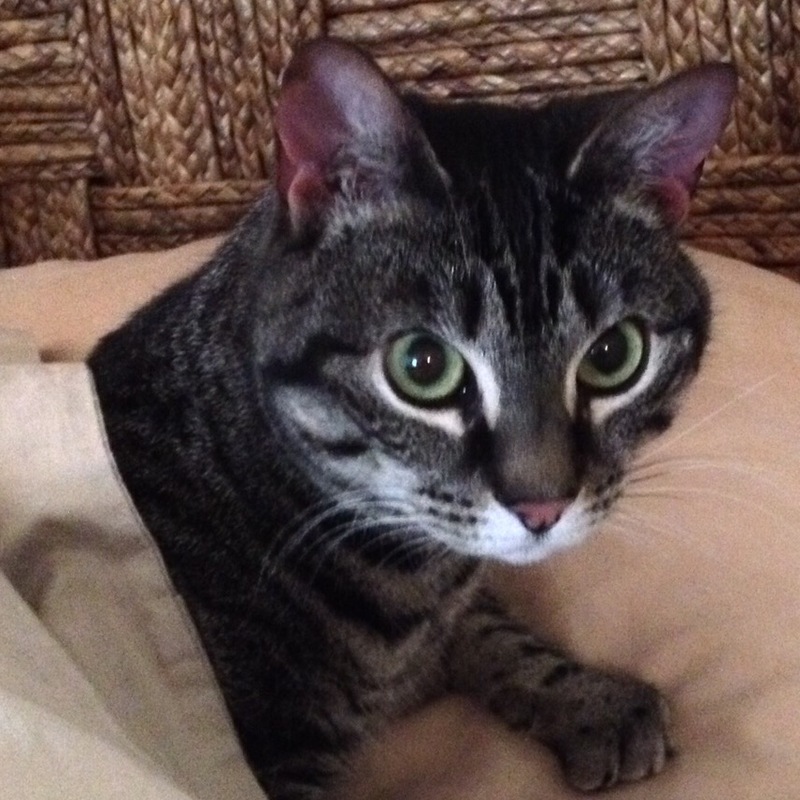 Time to add the “curtain” behind which our kitty is hiding. I recommend putting monofilament in the bobbin so that you won’t need to change it…and it eliminates the problem of stitching showing through on the back of the postcard at the end of the process. Pick up the long thin piece of fabric and scrunch…tack down with some stitches right at the top left corner (these will be trimmed away). Fold a quarter-inch or so under the long edge neared the kitty, and stitch around her face. I find the batik is the easiest to sculpt, but I have experimented with other fabrics as well. This is a perfect use of very small amounts of decorative thread that you would like to use up! 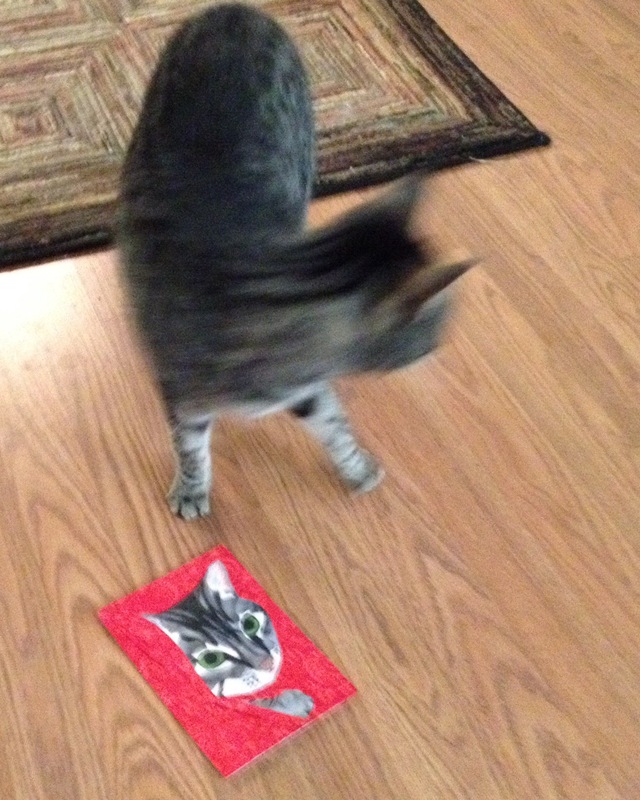 Now to the kitty. 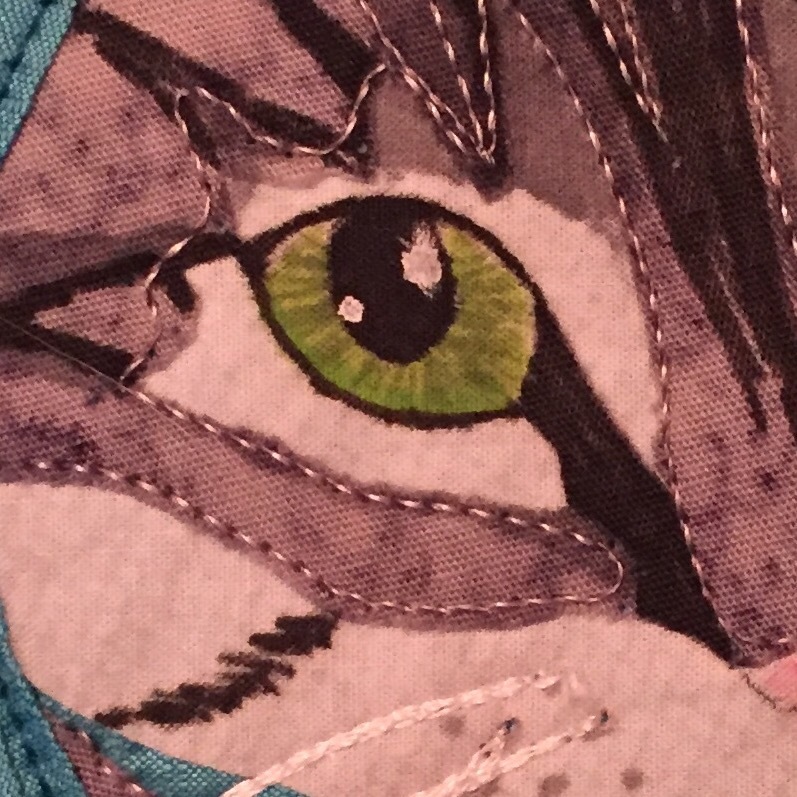 Choose a thread that is close to the “fur” color, but a bit lighter (I chose a light grey), and stitch the outlines of the medium value fabric. Time for ink! Green for the irises…black for the pupils and outlines of the eyes…dark grey (or dark brown…whichever hue you have chosen for the “fur”) to sketch in the lines of the pet’s coloring. I love Tsukineko’s Fabrico ink pens for this project. The eyes are one of my favorite parts; using 2 shades of green and drawing lines from pupil to the edge of the eye help achieve a more realistic look. After the black ink is dry, make sure to add a couple of highlights with white ink (or wite-out correction fluid). Don’t forget whiskers! Add a few grey dots along the jawline and use them as starting points. Using a shiny white thread (I love Superior’s Magnifico thread line), stitch out, pivot, and stitch back…repeat. Almost done. Take your portraits to your pressing surface and press a light-colored fabric to the backs of the Peltex. Trim to finished size (I stick with the regulation 4″ x 6″ size). 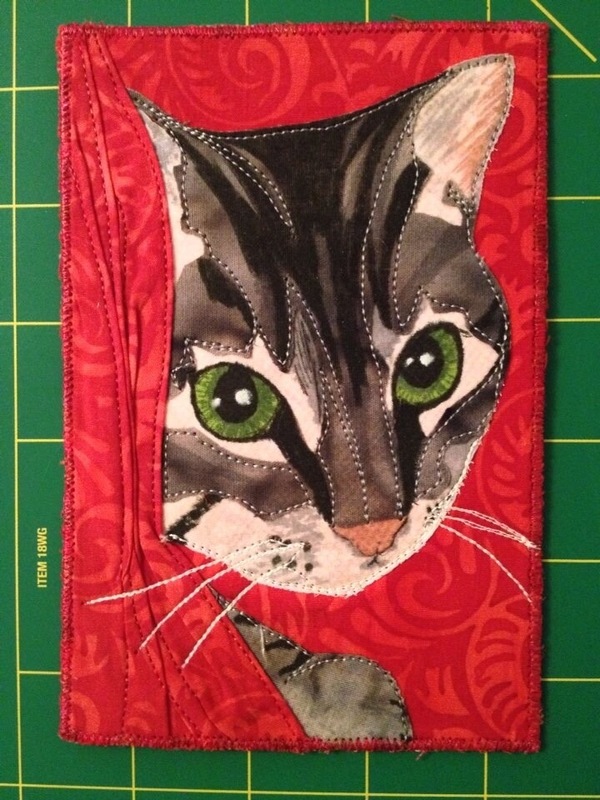 Now switch your bobbin to a matching thread as the top, and satin-stitch along the border. Finished and ready for official inspection! This entry was posted in Uncategorized on March 18, 2016 by neonkittyquilts. Hey Jackie! Well, one of my quilts is going (🎉) but I’m not sure if I will…trying to figure out schedule around 2 family weddings :).